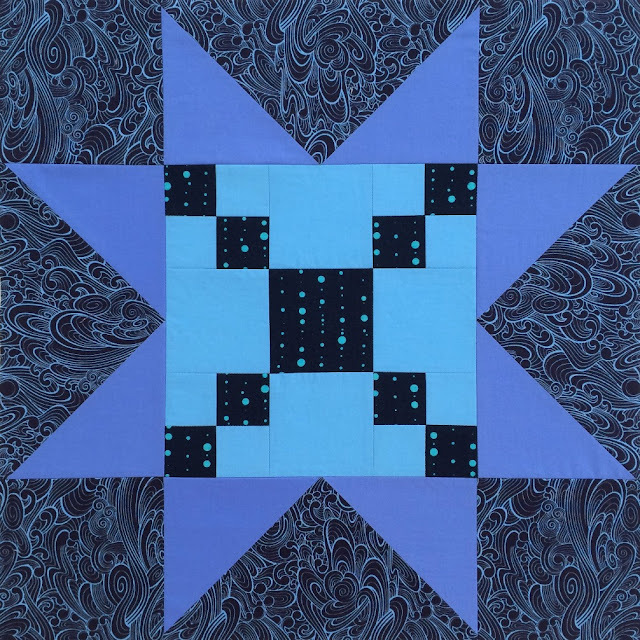 The Sawtooth Star quilt block is one of my favorite quilt blocks. 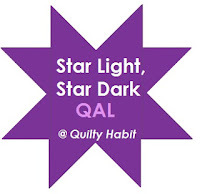 So when Jessica at Quilty Habit announced the Star Light, Star Dark Quilt-A-Long, I wanted to participate. My One Monthly Goal for August was to piece the 6 large Sawtooth Star blocks. Since I was trying to work from my stash and had limited cuts of some fabrics, I decided to include a pieced 9" block in the each center of the 18" Sawtooth Star blocks. My favorite is the dark blue block with a Single Irish Chain in the center. It almost glows with the Michael Miller Cotton Couture solids in Sailor and Wave. Also included are two prints, one is a print from True Colors by Tula Pink and the other is an Alison Glass print from the Sun Print 2015 collection. 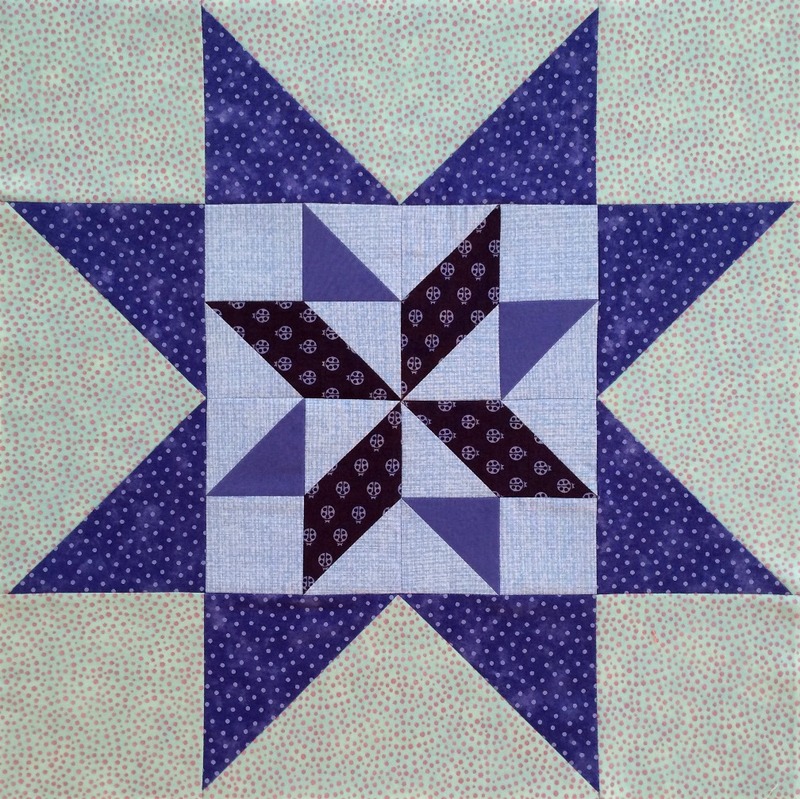 For the light blue block a Diamond Star was chosen for the center. I chose Spinning Star or Double Friendship Star for the center of the dark purple block. This is made from more Alison Glass, Kona solids and a Northcott print from the Artisan Spirit collection. 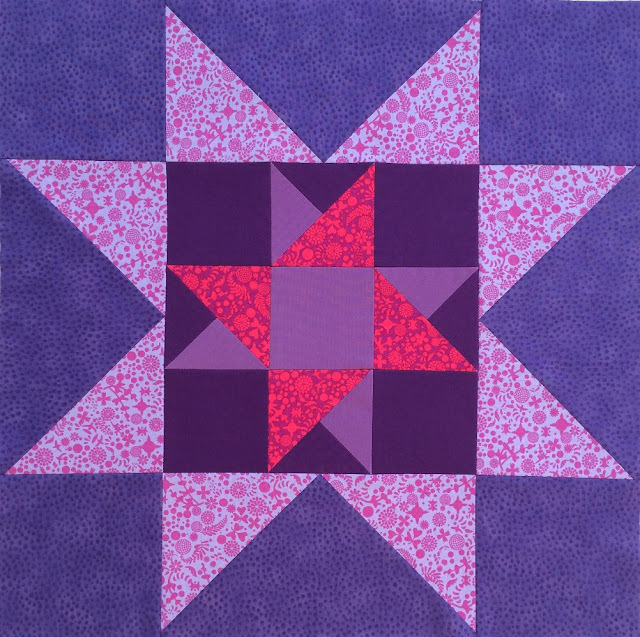 The center of the light purple block contains the Frayed Four-Patch. Again, this Sawtooth Star is made from Alison Glass prints, Kona solids and a Northcott print from the Artisan Spirit collection. 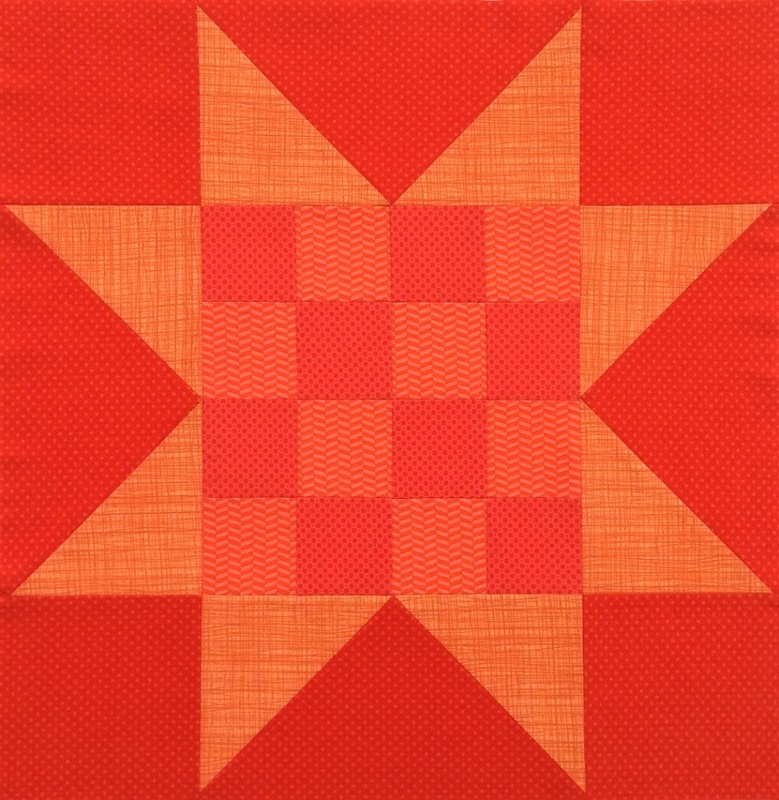 To represent the setting sun, this Sawtooth Star contains a micro dot from Blank Quilting and an unknown lighter orange. The 16-Patch center is made from one of the new Uppercase prints from Windham and a Cotton & Steel print. 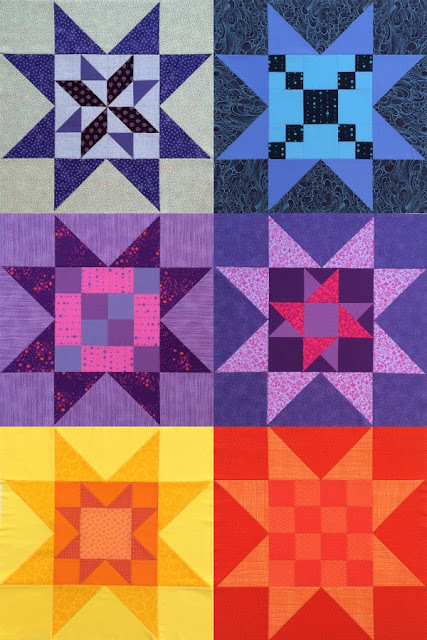 Lorna at Sew Fresh Quilts has a great tutorial for making the St. Louis 16-patch quilt block. 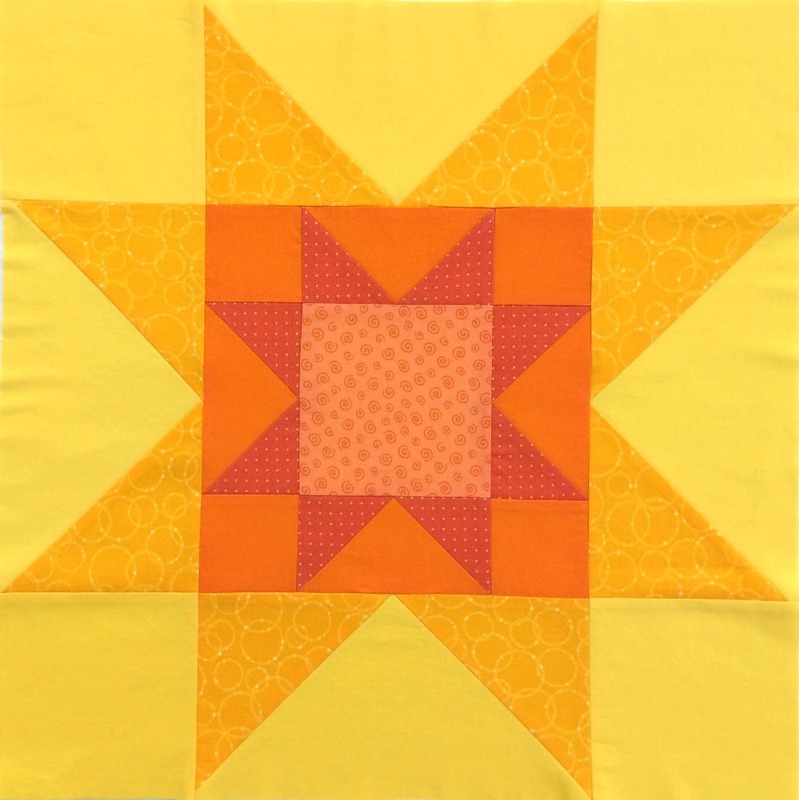 Wanting to incorporate some yellow with the orange, I actually unsewed this Double Sawtooth Star quilt block and added a Kona solid in Corn Yellow and this Dazzle print in Marigold. This turned out to be my least favorite. I think more time was spent selecting fabrics than the actual piecing. Here are all six Sawtooth Star blocks together with the light blocks on left and dark blocks on the right. 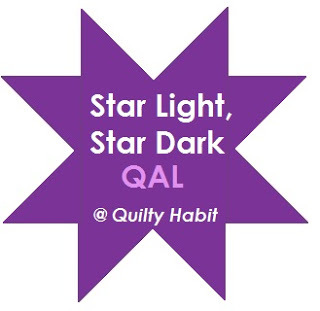 I'm linking to Jessica at Quilty Habit to share my progress on the Star Light, Star Dark Quilt-A-Long. And I'm sliding in under the wire to link to Heidi at Red Letter Quilts for the completion of my August One Monthly Goal. Also linking to Let's Bee Social, Needle and Thread Thursday, Fabric Frenzy Friday and Scraptastic Tuesday. The dark blue star really speaks to me as well, Paige, but I am also very much liking the double nested sawtooth star. I love how unique your version of this QAL is going to be! What fantastic versions of the star blocks Paige. I love them all but have to also say that the dark blue really speaks to me. They are all lovely Paige, but the diamond star has to be my favourite. You always use such beautiful fabrics and these blocks are no exception. 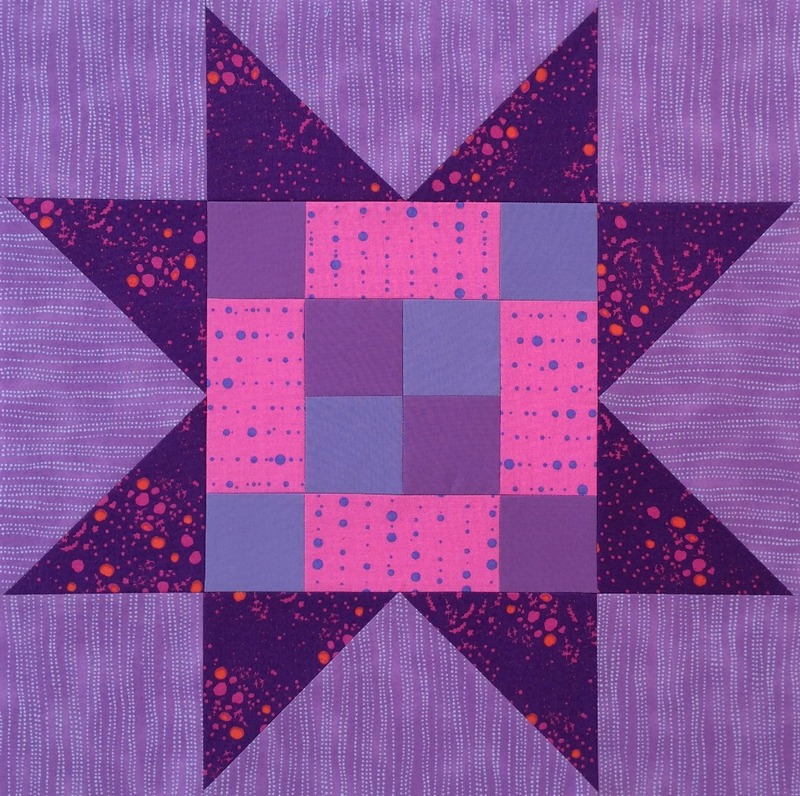 Your stars look great - and good idea to insert piecing in their centres, it adds an extra dimension. The pieced centres really make your stars shine! Love your blocks! Your fabric choices are fabulous! Love your blocks, Paige. I totally hear you with the fabric choosing taking longer than making the blocks. I'm experiencing the same thing with the Summer Sampler blocks. The dark purple star is my favorite. It is a so good idea to piece the centers ! And it brings a personal touch to the pattern. Great Job ! I love that you pieced the centers of the starts. It gives each block even more of a personality. And you are right selecting fabrics can sometimes take longer than it should. I really love that background print in the first one. The pattern on it looks like it could be FMQing. 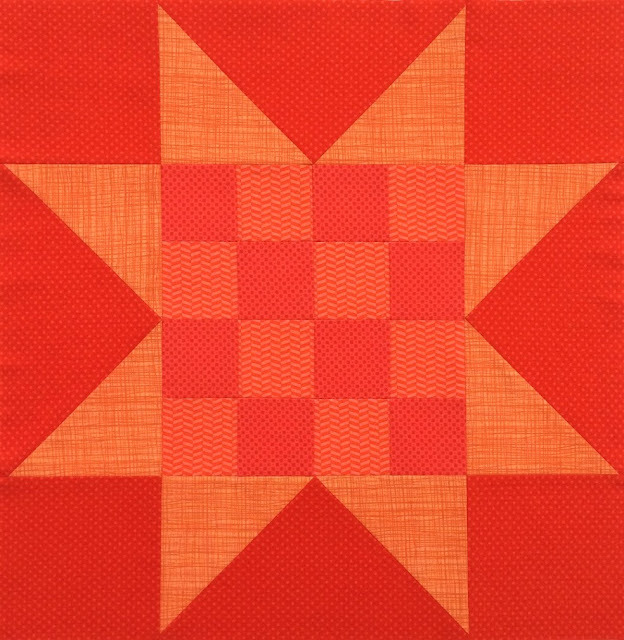 Hi Paige, When I saw your block with the Diamond Star center, I immediately thought that would make a gorgeous barn quilt! When we get our new house done, I know my husband is eventually going to build a shop as well and I hope he'll let me do one like this! The pieced centers of your stars are fabulous Paige! The blocks just stopped me in my tracks! You did an amazing job picking out fabrics for these blocks. Your work is so meticulous. The extra effort you've gone to with making each centre different has really paid off. All your blocks are great but my favourite is the light blue version with the diamond star. I agree with you that fabric selection is so important as is colour. The stars that pop are my favorite. Beautiful work. I like the yellow and orange ones. Probably because I am on a yellow and orange trend right now. Nice work! Your stars are just beautiful Paige - your piecing is so darn precise! Impressive! Congratulations Paige! I think the time spent selecting fabrics was well worth it, & for the pieced centers as well. I love all of them! Awesome! I love all of the different centers you added to the stars! They are all very pretty. I love how you put a design inside each star's center. The lt.blue with the diamond star is my favorite. Beautiful ! Love your fabric and colour choices ! It shows that you spent that time selecting fabrics! Well done on creating such beauties. Thanks for linking up to #scraptastictuesday. They are lovely, Paige! My favorite is the purple with the spinning star in the middle.